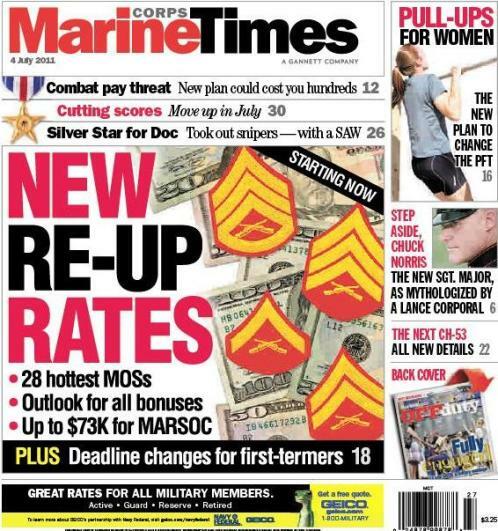 This week’s Marine Corps Times cover story zeroes in on a perennial issue of concern for Marines: re-enlistment bonuses. The new rates, effective July 1, go a long way toward showing what the Corps is prioritizing in its fight to retain good Marines. Even with a tightening fiscal outlook, the service will shell out tens of thousands of dollars to keep Marines in high-demand fields such as intelligence and special operations. Other fields will feel the pinch, but there are still dozens of specialties open to lateral moves that offer large sums of cash to Marines willing to do something new. We outline the options, explaining what’s coming and why certain priorities were set. Officials with Manpower & Reserve Affairs weigh in, too, offering guidance and answering tough questions about the plan. This week’s paper also include an early look at a new plan for the Physical Fitness Test that could incorporate pull-ups for women. It isn’t a done deal yet, but based on what we’ve seen, it sure looks like it’s coming for women who want to rack up a high score. Check it out on newsstands this week or subscribe here to read it online today.